WASHINGTON, Jun 6 2013 (IPS) - A quarter of all food calories grown for human consumption is being lost or wasted, either purposefully or otherwise, according to new estimates. With high food prices now widely seen as a new normal even as food demand across the globe continues to rapidly expand, advocates and development experts here are calling for concerted national and international action in a way that has not yet been seen. “The world faced an analogous failure of efficiency in the 1970s with energy,” states a new working paper produced jointly by the United Nations Environment Programme (UNEP) and the World Resources Institute (WRI), an environment and development advocacy group based here. The study estimates that the amount of land used to grow this wasted food would equal the size of Mexico and use some 28 million tonnes of fertiliser. The reasons behind this squandering of resources, however, are multifarious – running from inefficiencies in storage on farms and during transportation to market, to consumer confusion over how to deal with “old” food. The new findings coincide with the release of surprising new statistics on the extent of hunger across the globe. According to a series of studies published Thursday, malnutrition is responsible for some 45 percent of all deaths of children under five years old – far higher than the roughly one-third that was previously believed. 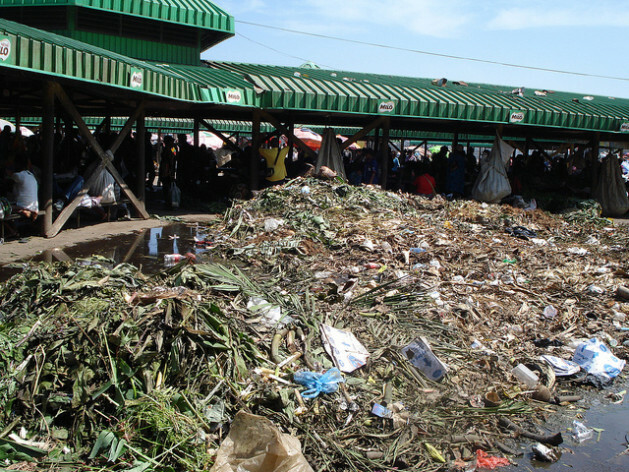 “To a great extent, the scope of this food waste is a technology failure, with, for instance, farmers in Africa still not having the electricity that they need for cold storage,” Craig Hanson, a WRI co-author of the new working paper, told IPS. On the face of it, the levels of food wastage appear to be broadly similar between developed and developing countries. Around 56 percent of total wastage is taking place in industrialised countries, versus around 44 percent in the developing world. Indeed, South and Southeast Asia are responsible for nearly a quarter of all food waste globally, while the countries of industrialised Asia are accountable for another 28 percent. Yet those figures mask far greater per capita discrepancies, particularly with regards to North America. The U.S. government estimates, for instance, that the country alone wastes around 40 percent of its food supply. Most of the world’s regions are wasting between 400,000 (South and Southeast Asia) and 750,000 (Europe) calories per person every day, the new report states. Yet in North America, that figure jumps more than 1.5 million, based on 2011 statistics. According to current international standards, an active adult requires between 2,200 and 3,000 calories per day. Of course, the looming spectre in this issue is the roughly 10 billion more people that may live on the planet by 2050 – and the estimated 60 percent more calories required to feed them, over 2006 levels. Simply cutting today’s rate of food waste in half, to around 12 percent, by 2050 would save around 22 percent of that projected shortfall, the new investigation suggests. Still, the onus appears to be on producers, transporters – and consumers, found to be responsible for around 35 percent of all food waste. Yet experts say these characteristics open up important opportunities for targeting women, who around the world are primarily responsible for both agriculture- and home-related decision-making. “Women produce, process, cook and distribute food, and so helping them find ways to reduce food waste and loss in the field, in storage, at the consumer level and at home is key,” Danielle Nierenberg, a co-founder of Food Tank, a Washington think tank, told IPS. Here in the United States, food wastage has reportedly grown by 50 percent over the past four decades. On Tuesday, the country’s central environmental and agricultural agencies announced a major new initiative aimed at educating consumers and companies about the scale of the country’s food waste problem. The European Union has gone still farther, setting a goal of reducing its food wastage by half by 2020. That’s tremendously optimistic (it’s still up to individual E.U. countries to figure out how to implement the goal), but according to WRI’s Hanson, European companies are expressing significant enthusiasm over the target. With the recent publication of a report by a United Nations-appointed panel, discussions on the next phase of the Millennium Development Goals (MDGs) framework is now taking concrete shape. One of the draft goals proposed in that report would include reducing “postharvest loss and waste” by a certain percent, which is yet to be agreed upon. Hanson suggests 50 percent for that goal. He and his fellow researchers are also calling for an international protocol that would offer a standard methodology for countries and companies around the world to ascertain how much food is getting wasted and where.